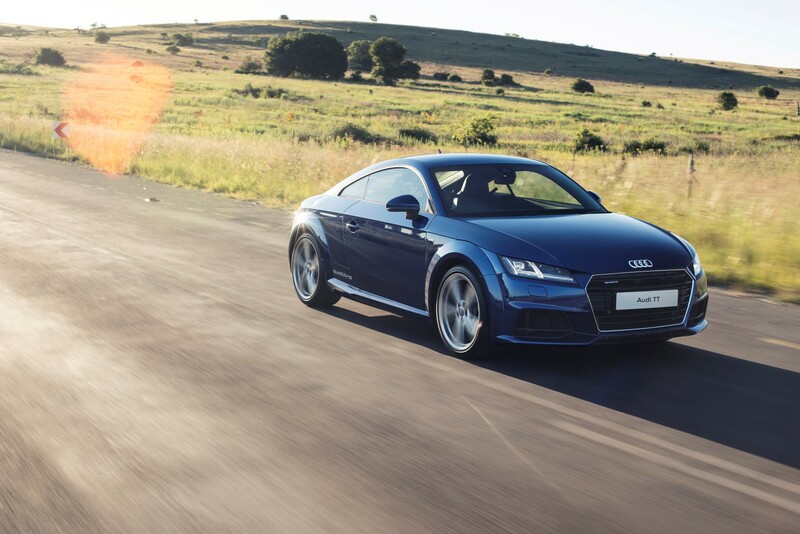 The Audi TT was first introduced to South Africa in 2000 and signaled the new era for Audi design in the early 2000’s. 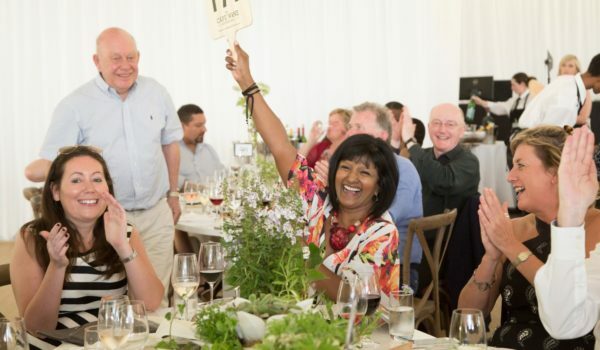 The first generation was fairly popular in South Africa having sold 1,968 units between 2000 and 2006. 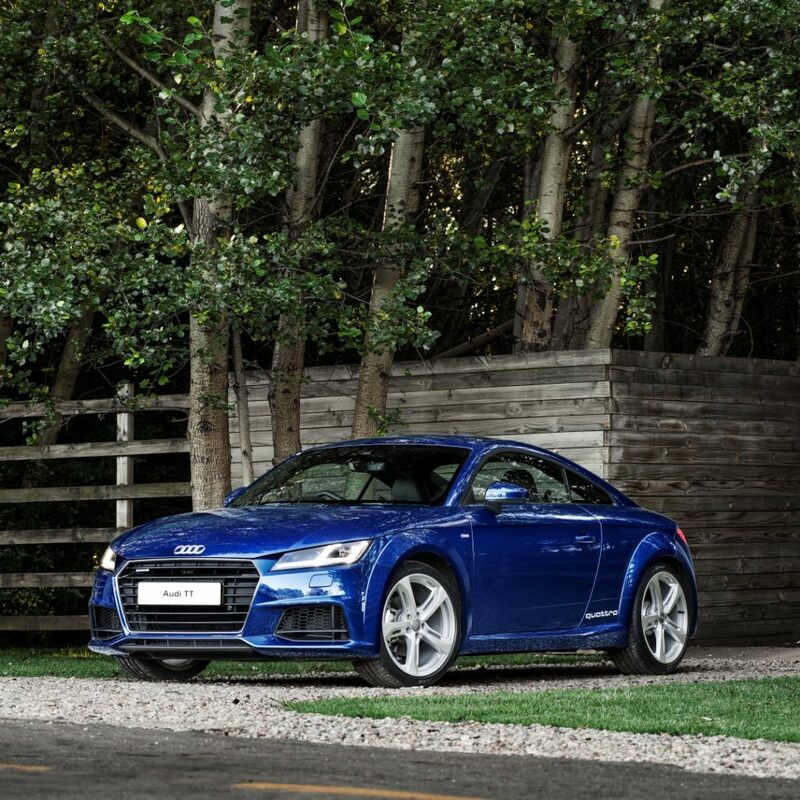 It was followed by the second generation Audi TT which was a design departure from the first generation, but saw the TT take on an elegant silhouette. 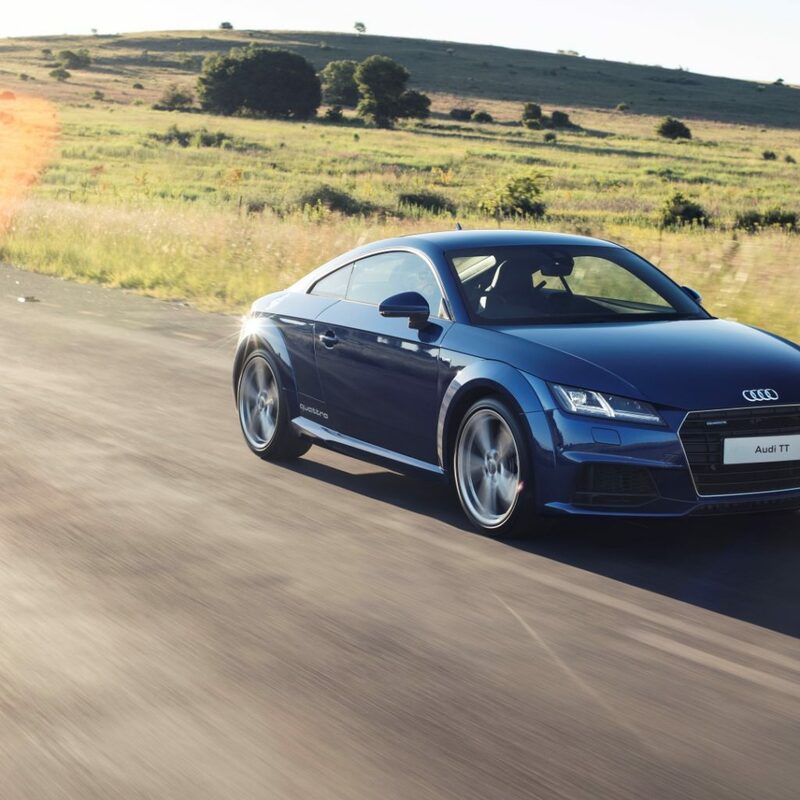 This model sold a total of 2,840 units in the South African market. 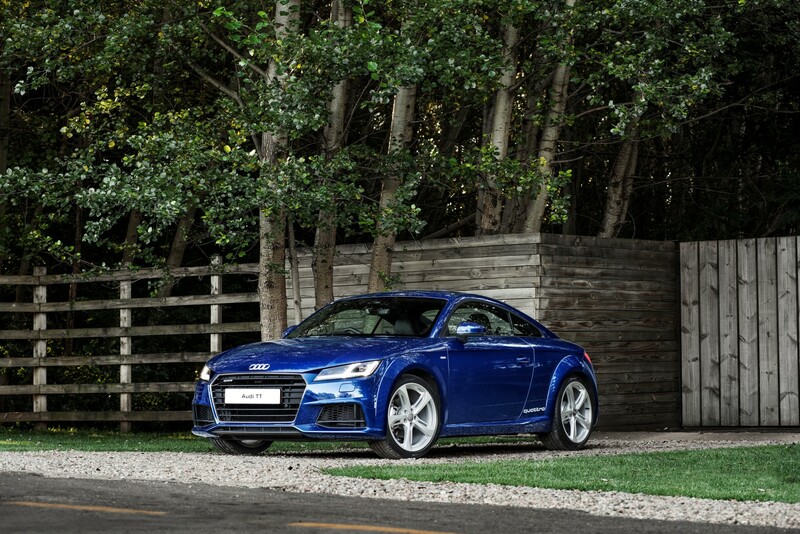 The model range consisted of a Coupé and Roadster, as well as performance models, the TTS and TTRS. 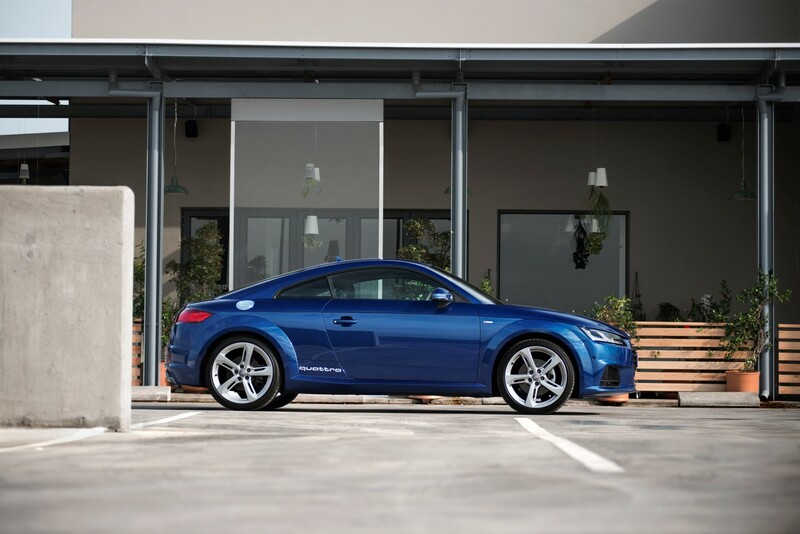 The third generation Audi TT Coupé has taken many of its design cues from the first generation car. The contour of the sills create a striking refracting edge, while the broad wheel arches form their own geometric bodies. The front wheel arch breaches the line of the bonnet, which continues over the door as a tornado line and runs almost horizontally through to the tail as a strong body shoulder. 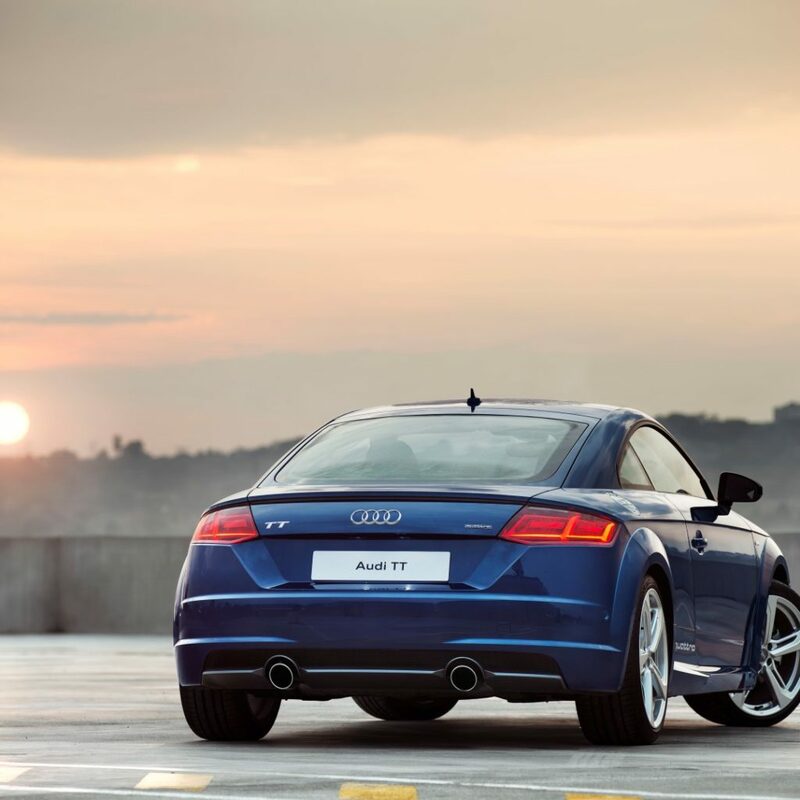 Its rear design and twin tailpipes are also positioned closer to the middle of the vehicle, reminiscent of the first generation Audi TT. 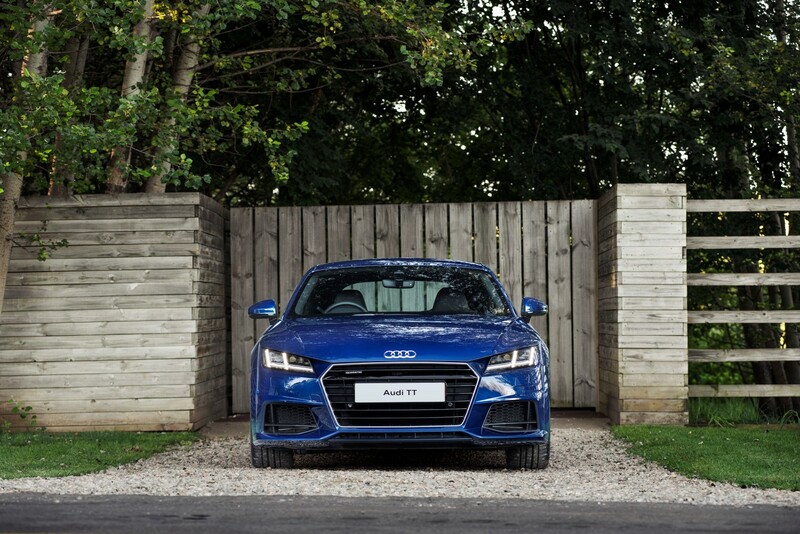 The front of the new TT is dominated by horizontal lines. The three-dimensional Singleframe grille is much broader and flatter than that of the previous model, with a powerful line dividing it into two zones. 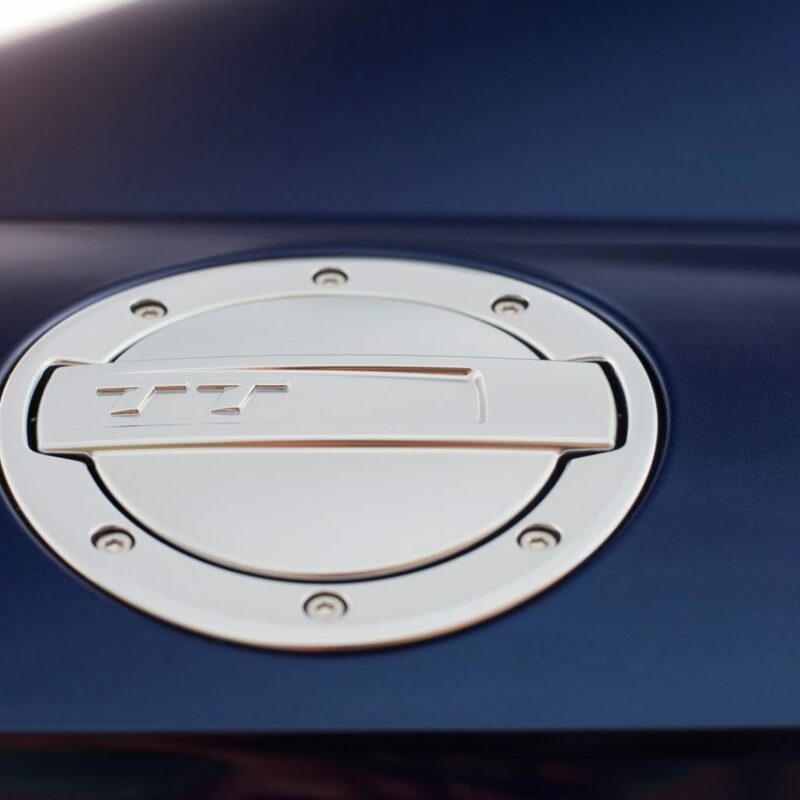 Starting in the top corners of the grille, sharp contours run in a V across the bonnet, which bears the four Audi rings – as on the Audi R8. 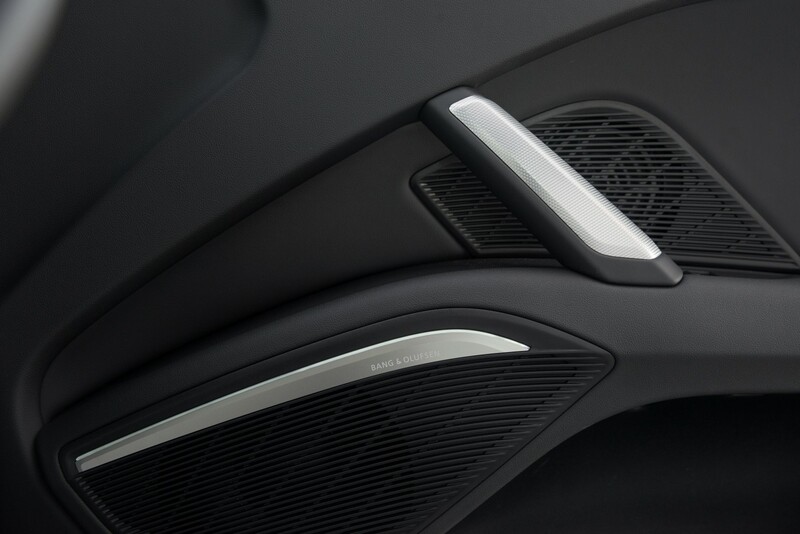 The air intakes feature struts that direct part of the flow away from the front to the flanks. 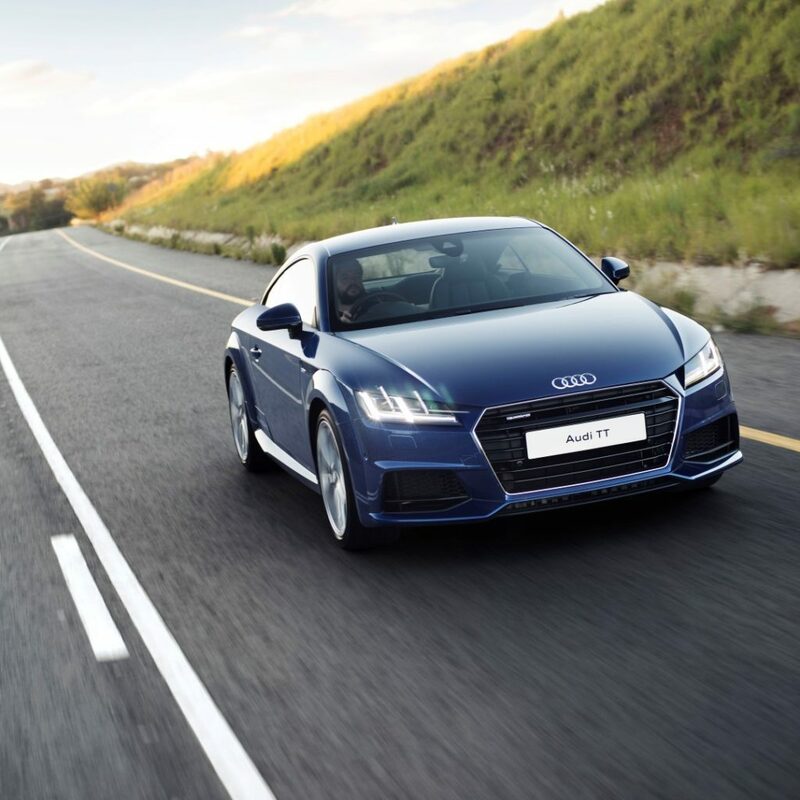 Xenon plus headlights are standard, and Audi can optionally provide LED headlights or Audi Matrix LED headlights, where the high beam is generated by controllable individual LEDs. 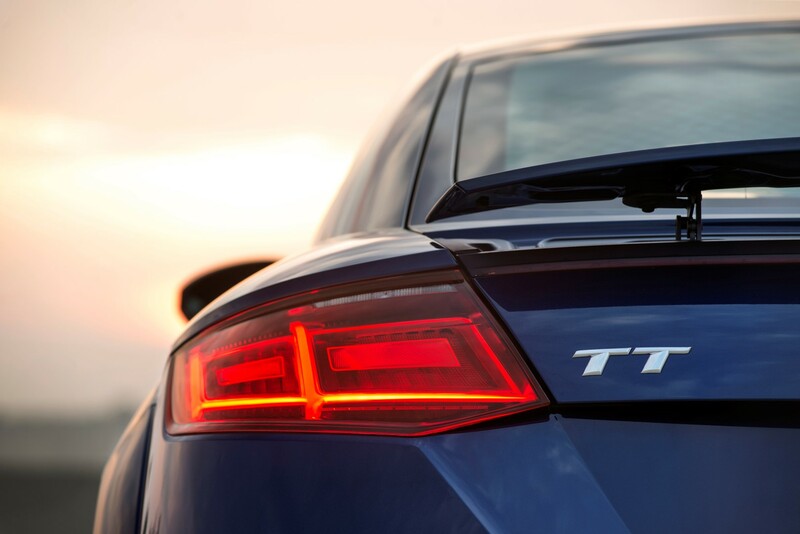 The LED headlights and Matrix LED headlights also include dynamic turn signals. 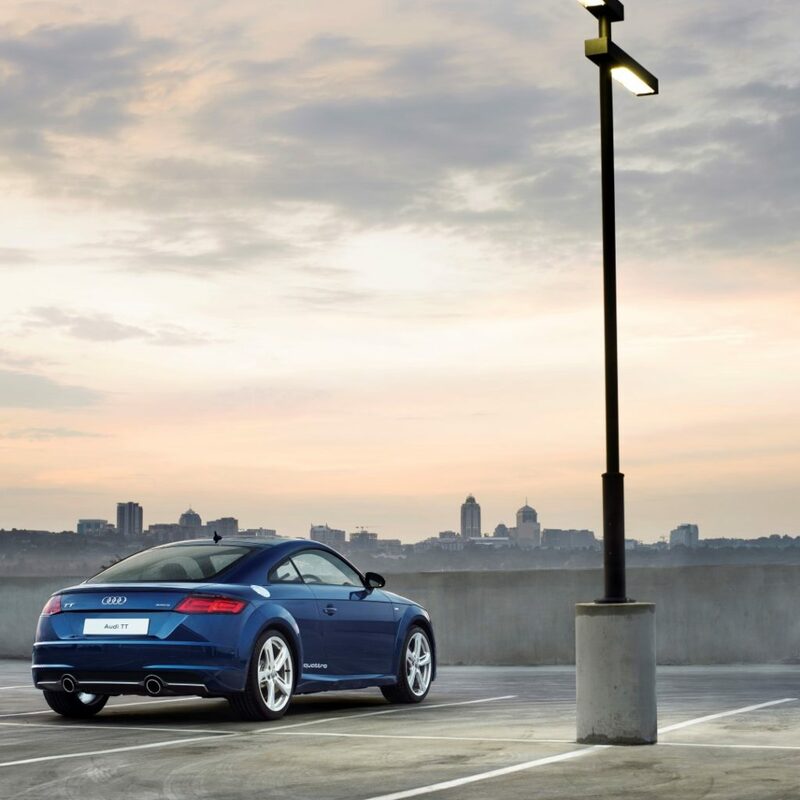 From the side, the new Audi TT is equally lean and muscular with a low stance. 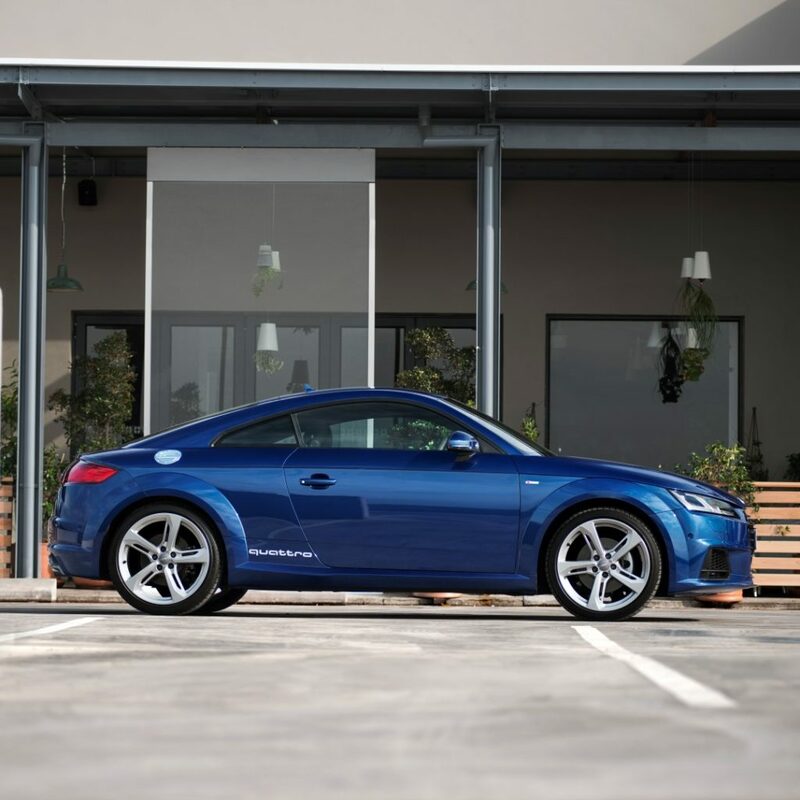 At 4.18 metres, the Coupé is almost exactly the same length as its predecessor, though its wheelbase has grown by 37 mm to 2,505 mm, making for especially short overhangs. It is 1,832 mm wide, and has the same height as the previous model at 1,353 mm. 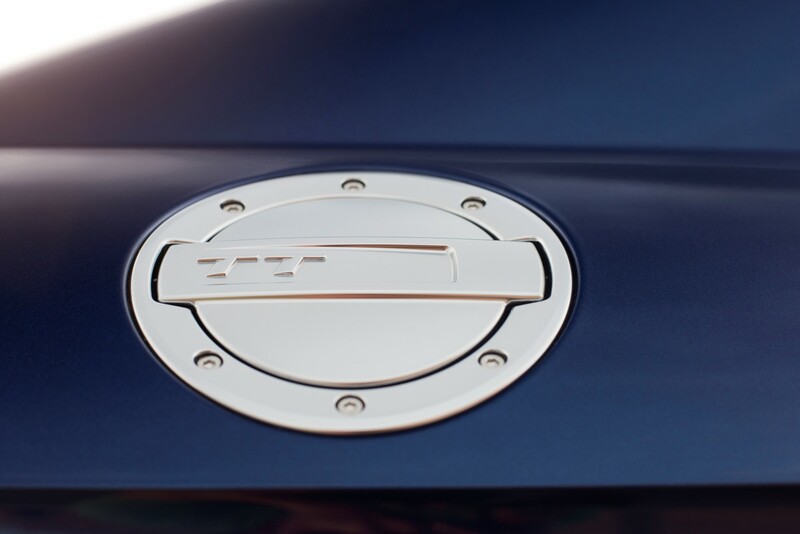 The fuel flap on the right side panel is the classic circle and surrounded by socket screws – again reminiscent of the first-generation TT. A new feature is that there is no nozzle cap beneath the flap. This means that the pump nozzle slots straight into the tank neck, a feature taken from Audi’s Le Mans car. 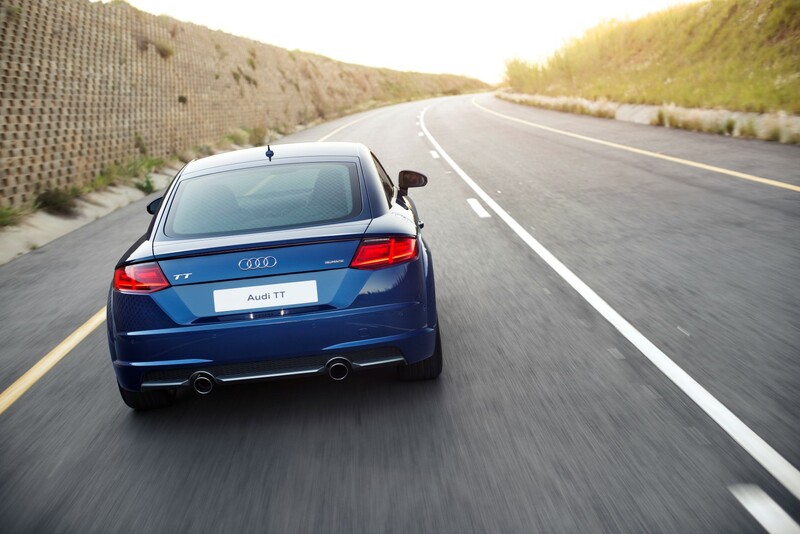 Specifically at the tail, horizontal lines and twin tailpipes underline the impression of the new TT’s sporty width. 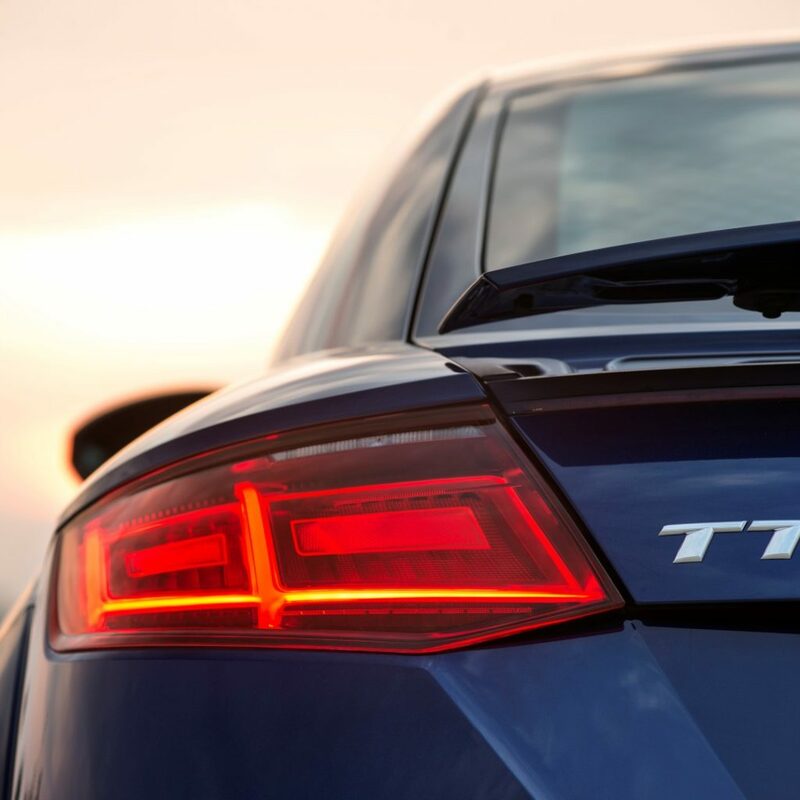 The third brake light is an extremely narrow strip positioned under the edge of the rear spoiler and plays an essential part in defining the tail light silhouette. 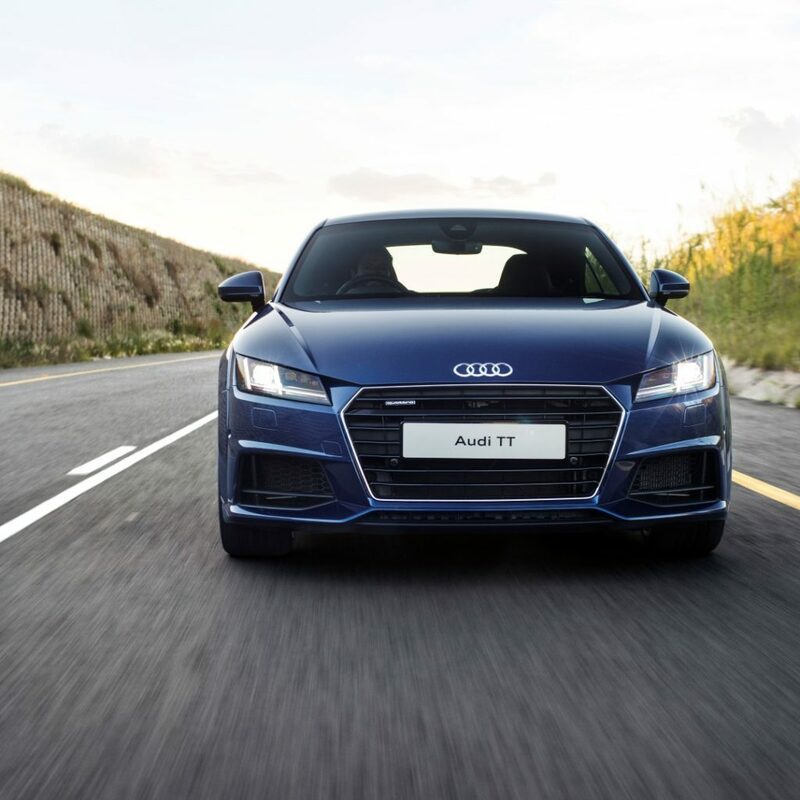 Lightweight construction is one of Audi’s greatest areas of expertise and impacts positively on acceleration, handling and fuel consumption. 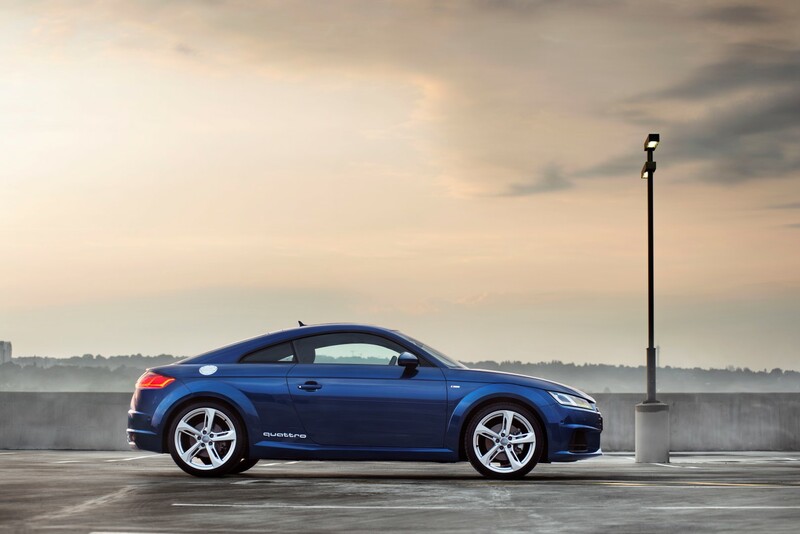 The second-generation Audi TT featured an Audi Space Frame (ASF) body made from aluminum and steel. 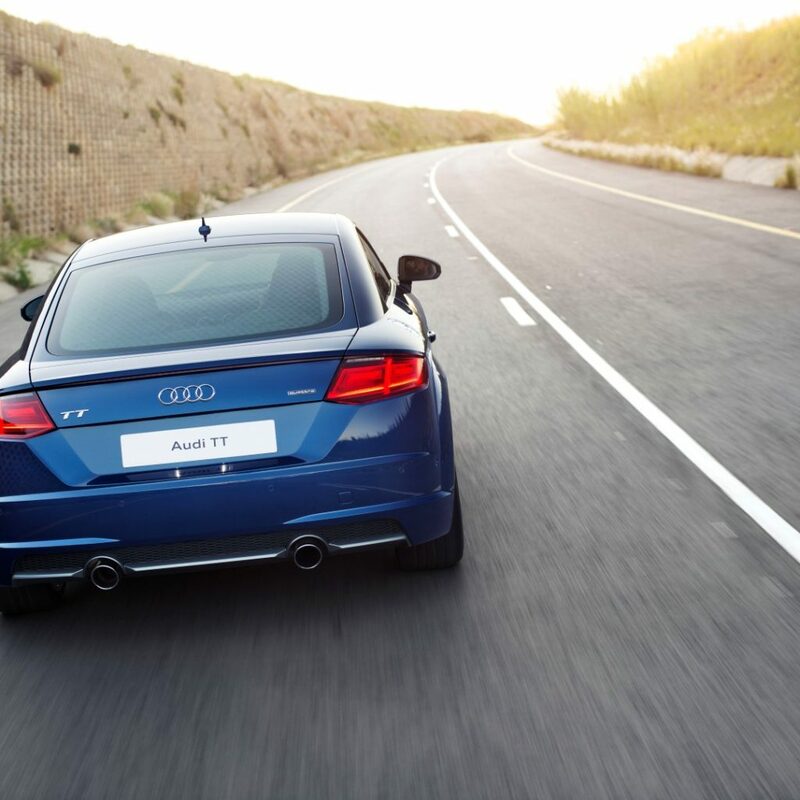 For the new TT, Audi has systematically taken this composite construction principle even further, therefore the Coupé’s underbody structure has optimized axle loads and is made of modern, high-strength and ultra-high-strength steel alloys. 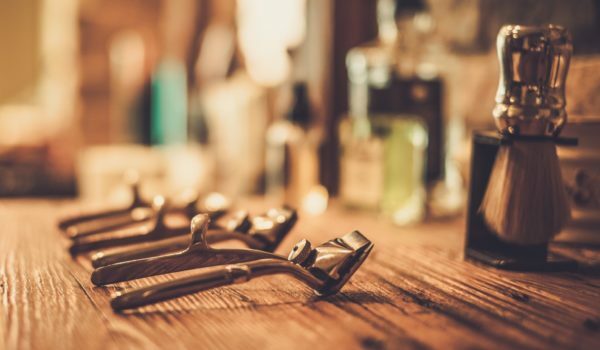 In the sections of the passenger cell that are subject to the most structural stress, form-hardened steel panels, which are both ultra-high-strength and light are used – these constitute 17 percent of the body’s weight. The side sills and roof frame are made of extruded aluminum profiles that are integrated into the structure using cast aluminum nodes. This structural principle creates a very rigid and safe bodyshell. The aluminum side sections and roof complete the structure. 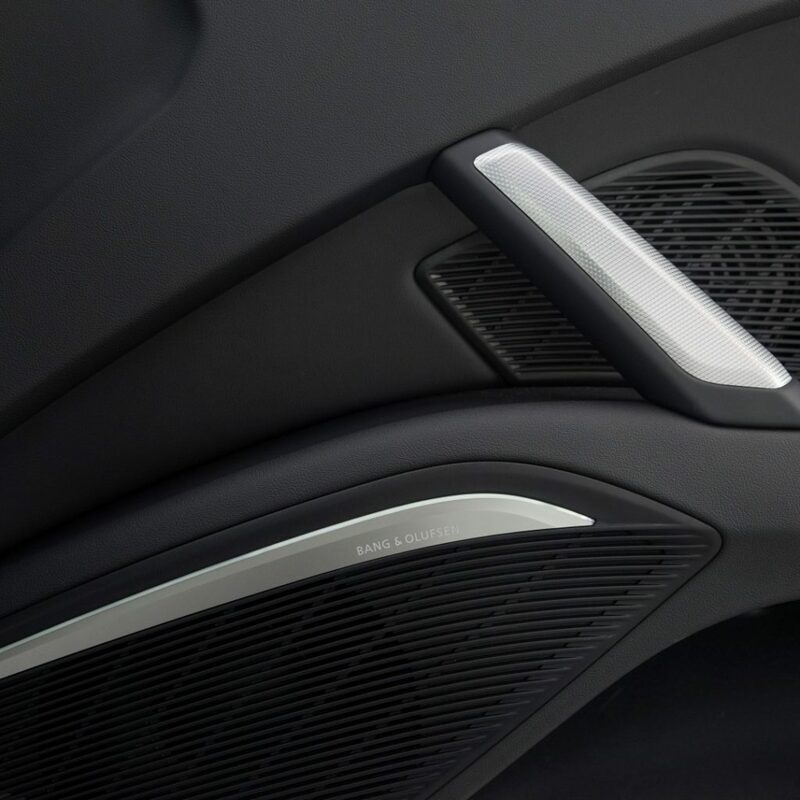 The hood, doors and trunk lid are also made of this light metal. 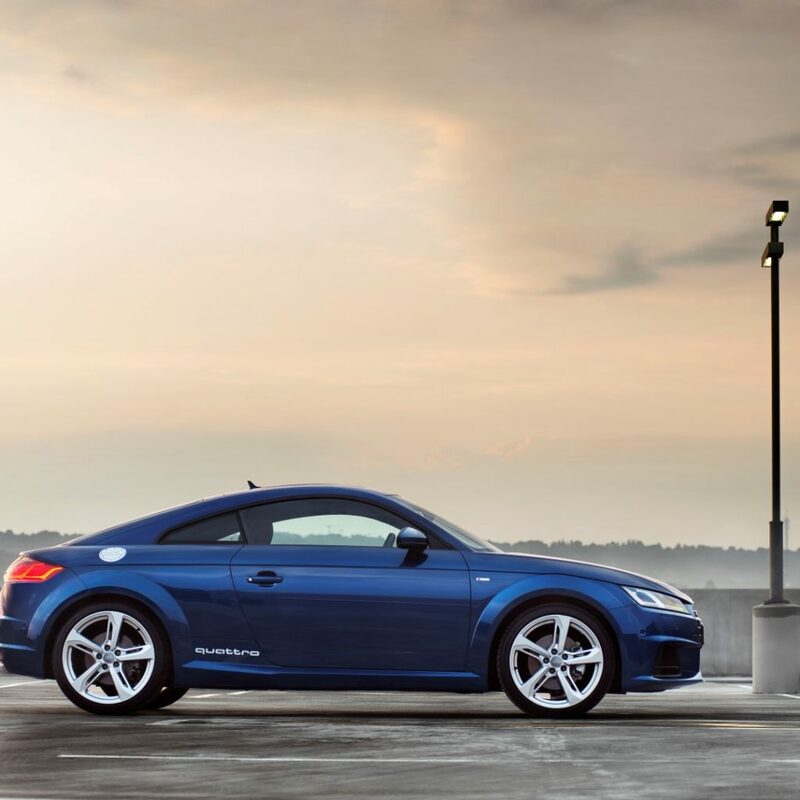 Audi engineers have, for the second time in a row, succeeded in significantly reducing the unladen weight of the Audi TT. 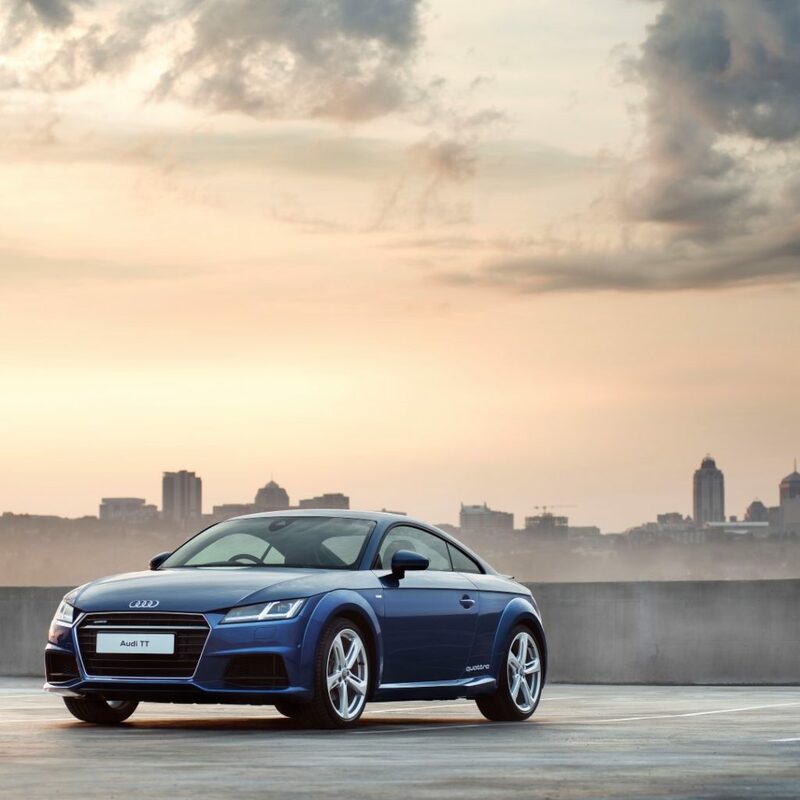 At the first model change in 2006, up to 90 kg was saved, and the 2.0 TFSI engine variant of the new TT weighs just 1,230 kg – 50 kg lighter than its predecessor. 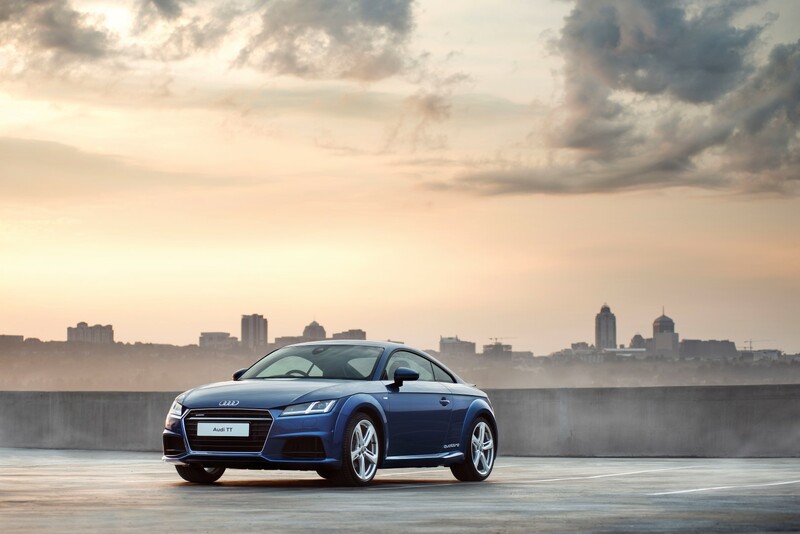 Undoubtedly the biggest revolution is in the interior of the new Audi TT. 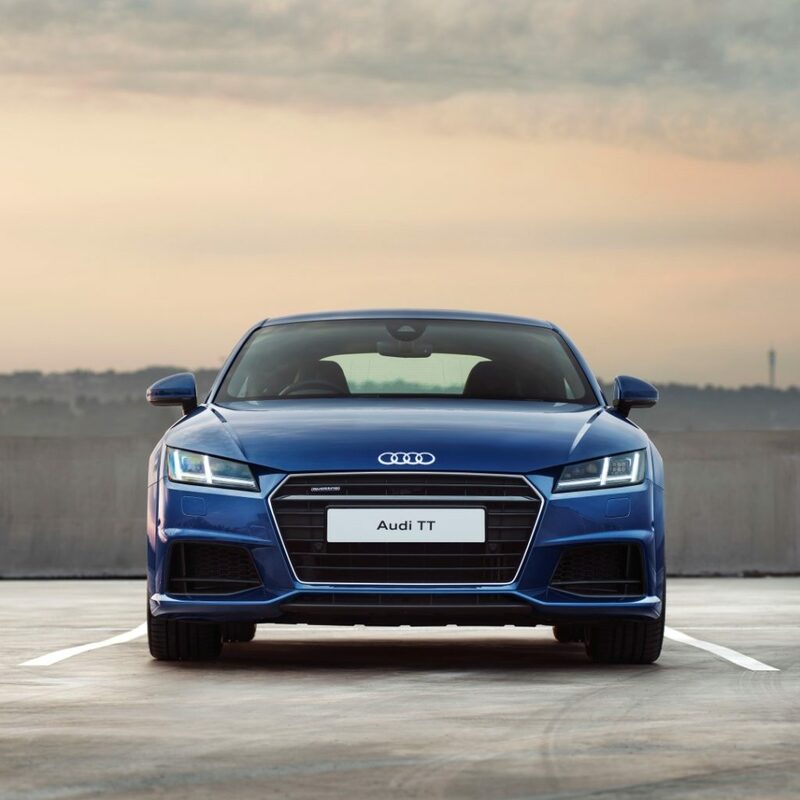 As with the exterior, horizontal lines and surfaces emphasize the width while clear and purist lines underscore both the lightness and the uncompromising sportiness of the Audi TT’s interior. 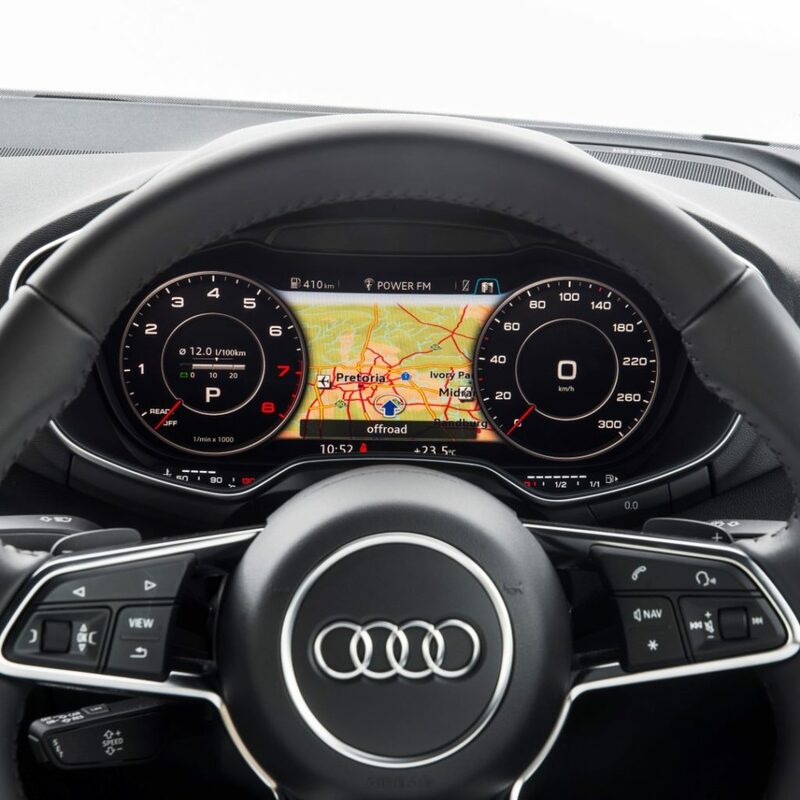 Two other ingenious design and technically innovative tricks enabled the designers to create an instrument panel that is the first of its kind. 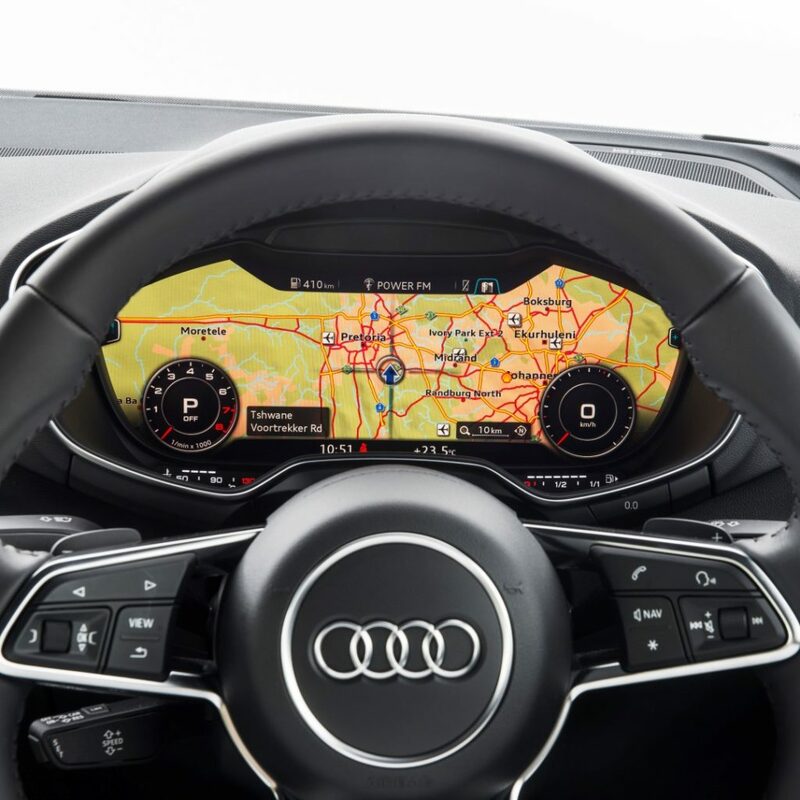 The instrument cluster and the MMI screen have been combined to form a central, digital unit – the Audi virtual cockpit. 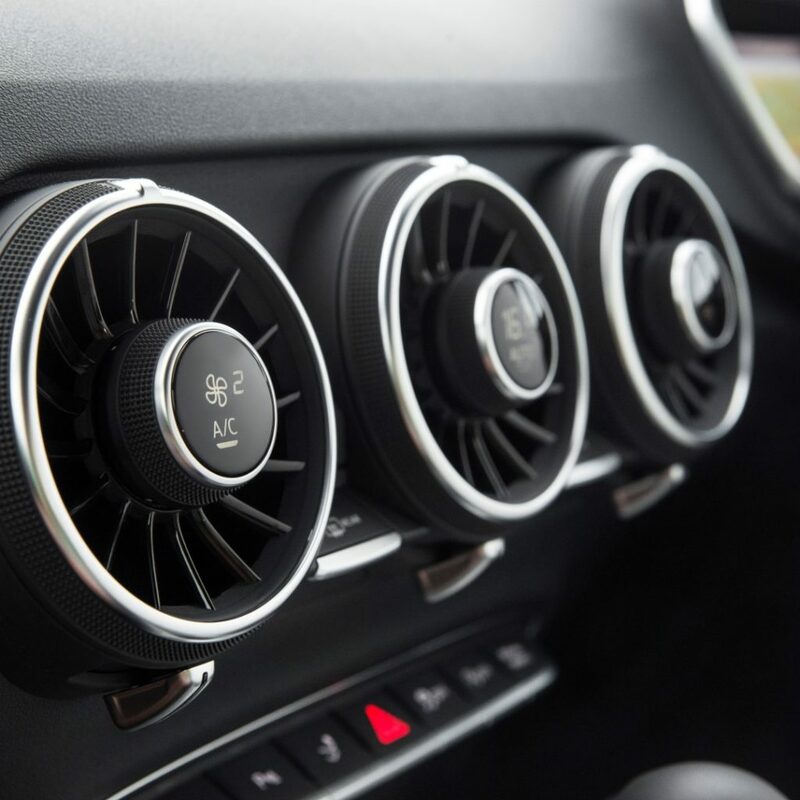 In addition, the controls for the air conditioning system are positioned directly in the air conditioning vents. 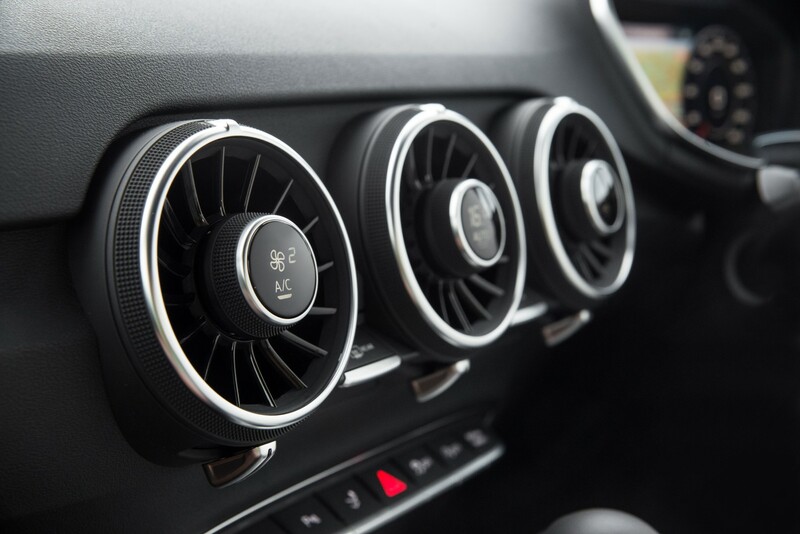 Seat heating, temperature, direction, air distribution and air flow strength controls are located at their centre, while the setting selected is shown on small displays in the air conditioning system. 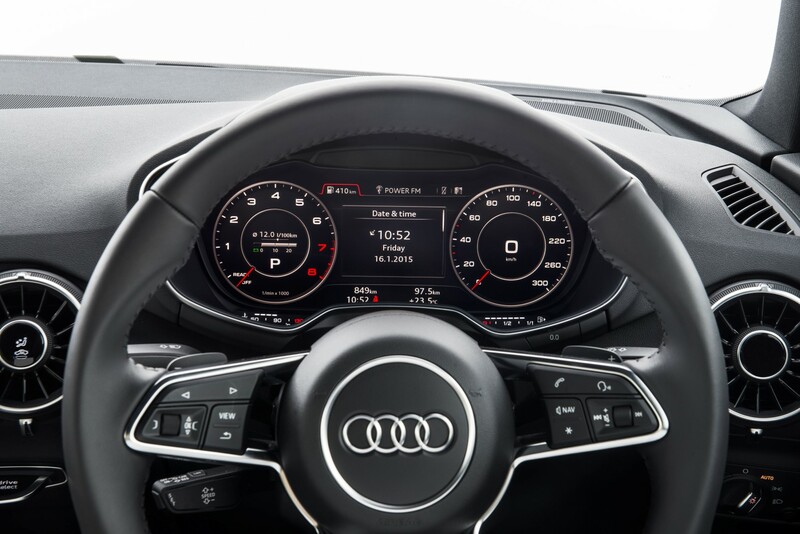 The Audi Virtual Cockpit is a fully digital instrument cluster which sets new standards with its dynamic animations and precise graphics. Drivers can choose between two display modes: In the classic view, the speedometer and rev counter are in the foreground; in “infotainment” mode the virtual instruments are smaller. 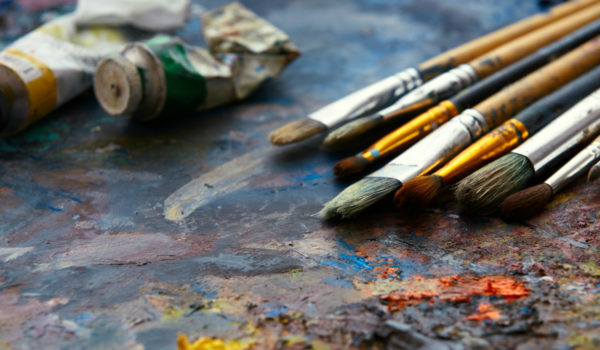 The space that becomes free as a result provides ample room for other functions, such as the navigation map. 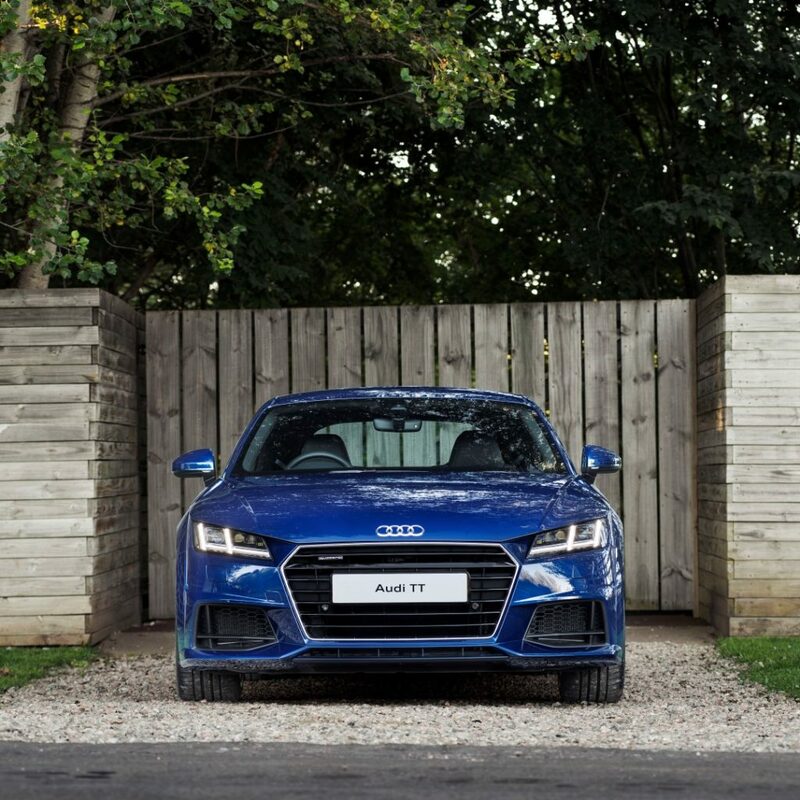 The operating concept for the new Audi TT has been revised from the ground up – in line with the consistent sports car character, all the elements focus on the driver. All functions can be activated from the multifunction steering wheel without taking your eyes off the road. Two toggle switches activate the navigation/map, telephone, radio and media menus. There are two buttons on both sides of the central rotary pushbutton, supplemented by a main menu and a back button. The driver can easily enter destinations using the touchpad on the top of the rotary pushbutton which recognizes your personal handwriting. It is also possible to scroll through lists or zoom in on maps. With a resolution of 1,440 x 540 pixels, the 12.3” TFT screen boasts brilliantly sharp images. At work in the background is a Tegra 30 graphic processor from market leader Nvidia’s Tegra 3 series. 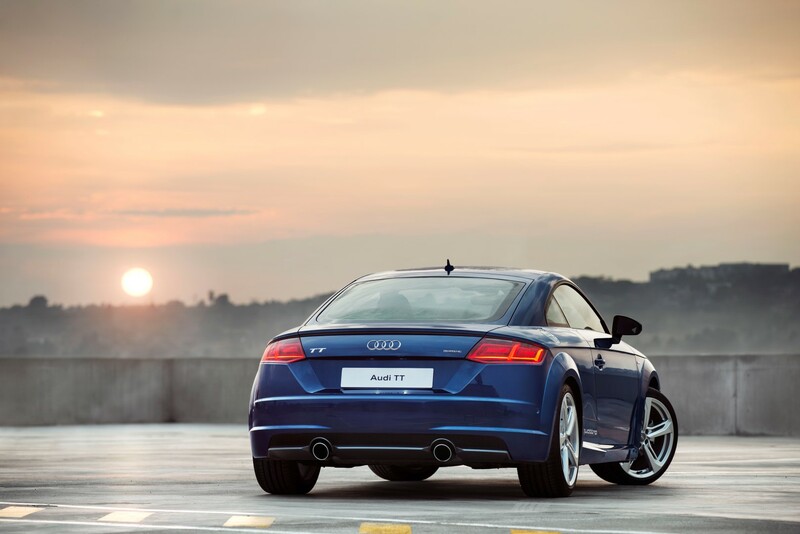 Audi South Africa will offer the new Audi TT with a four-cylinder engine including turbocharging and direct injection. 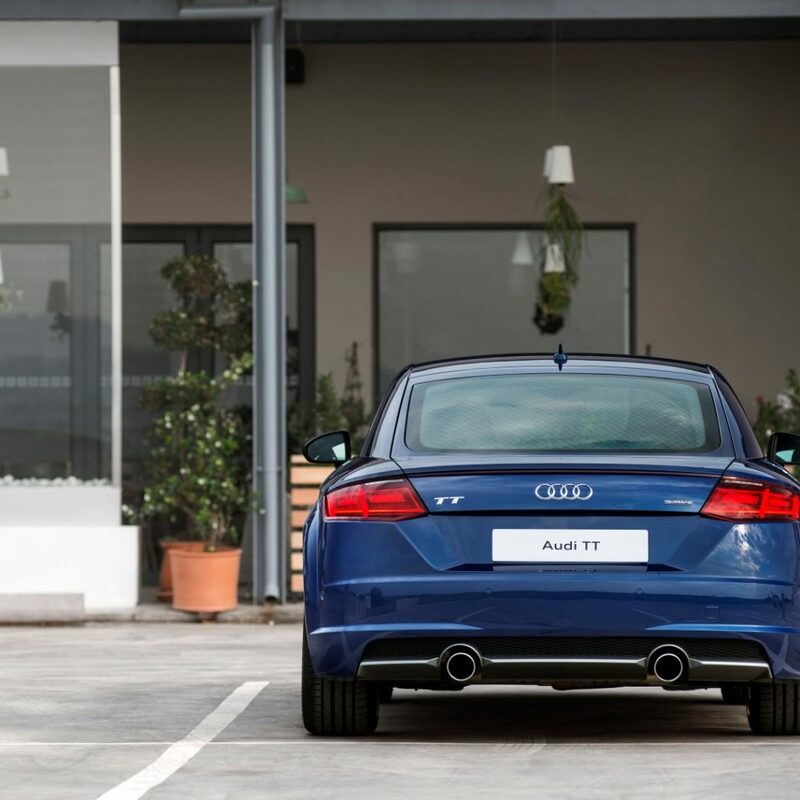 The 2.0 TFSI petrol engine combines athletic power with trailblazing efficiency and start-stop as a standard feature. 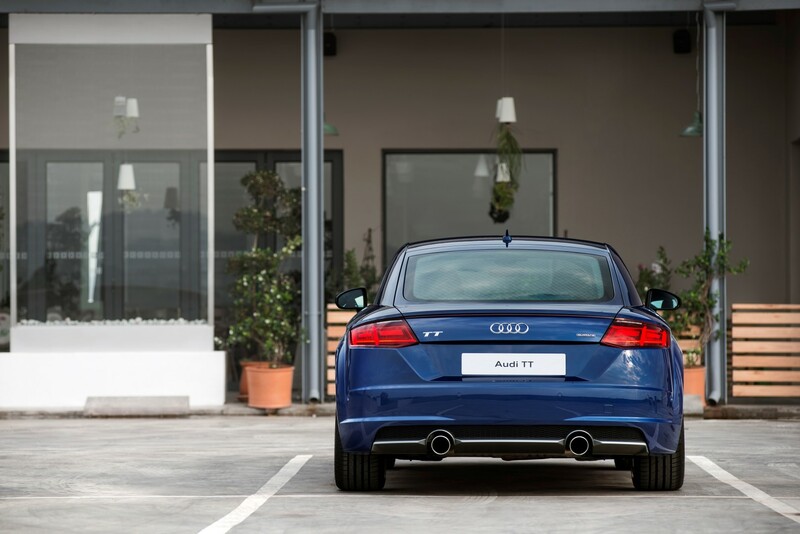 The 2.0 TFSI is available in two versions – a 169 kW front-wheel drive version, as well as a 169 kW quattro version. 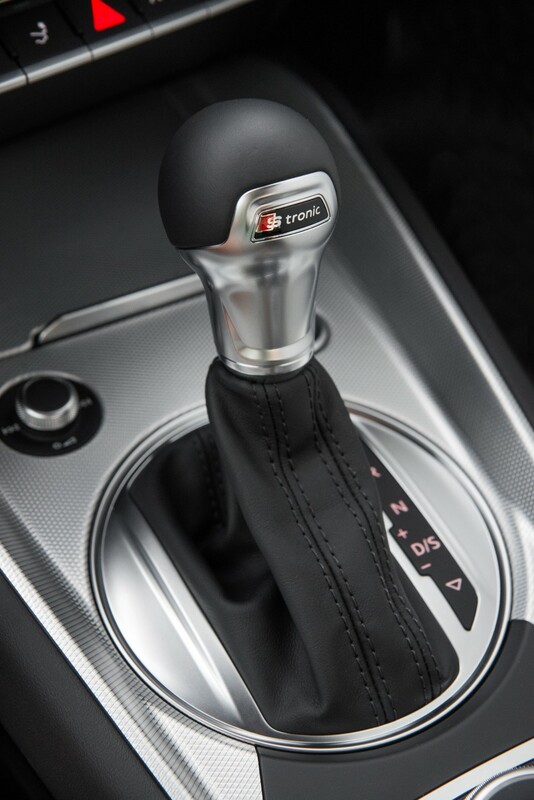 It delivers a torque figure of 370 Nm from 1,600 to 4,300 rpm. It accelerates the 2.0T FSI S tronic front-wheel drive from 0 to 100 km/h in 5.9 seconds, up to an electronically governed top speed of 250 km/h. The fuel consumption for this seven-speed S tronic model is 6.3 litres per 100 km with a corresponding CO2 emissions figure of 146 g/km. 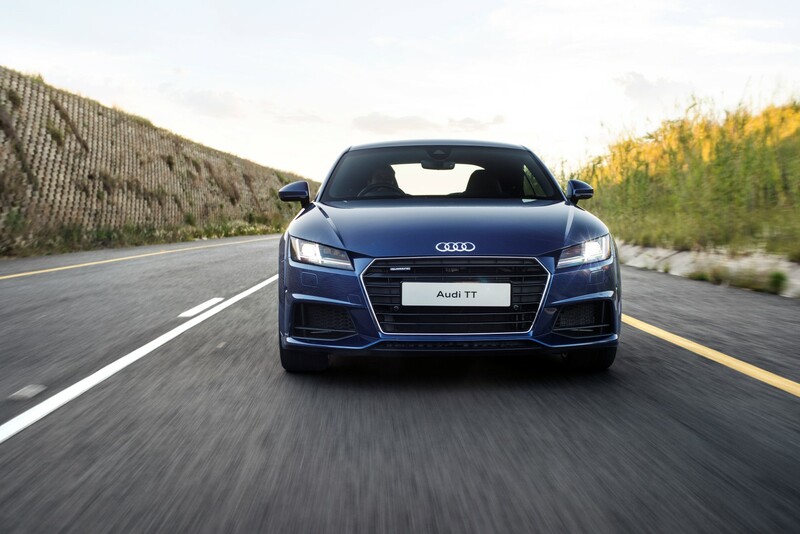 On the version with six-speed S tronic and quattro all-wheel drive, the sprint from 0 to 100 km/h takes 5.3 seconds; top speed is 250 km/h; fuel consumption of 6.8 litres per 100 km and CO2 emissions of 159 g per km. 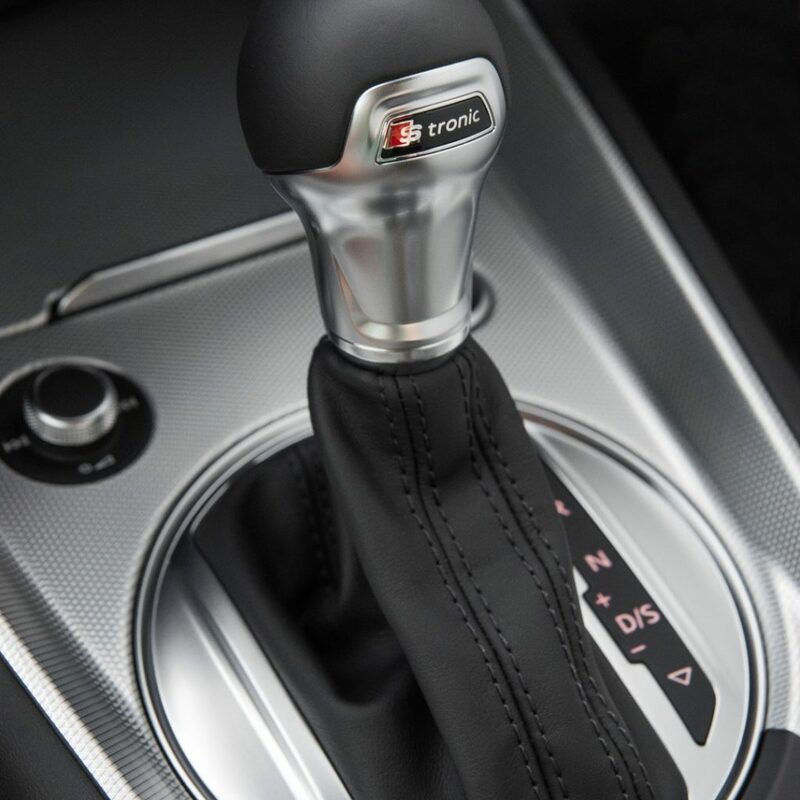 The dual-clutch transmission shifts through the six gears without any noticeable interruption in traction, and in manual model it can be controlled by paddles on the steering wheel. 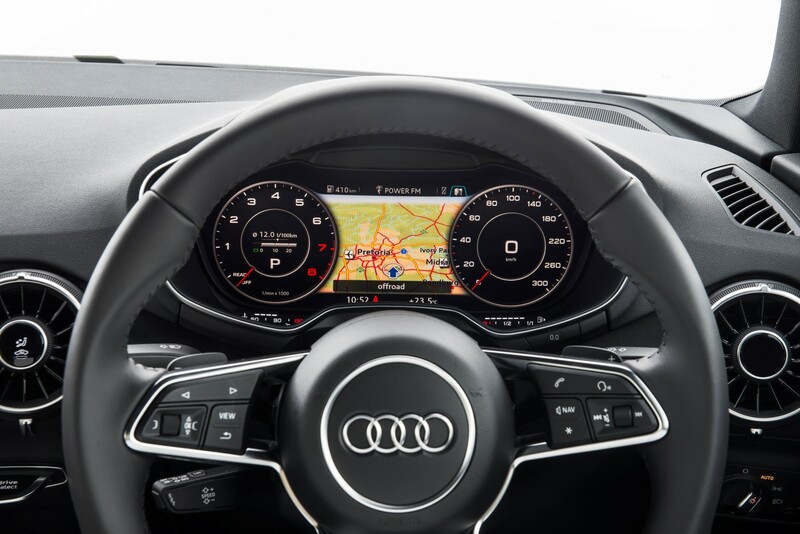 In the “efficiency” mode of Audi drive select, the S tronic selects freewheel as soon as the driver takes his or her foot off the gas pedal. 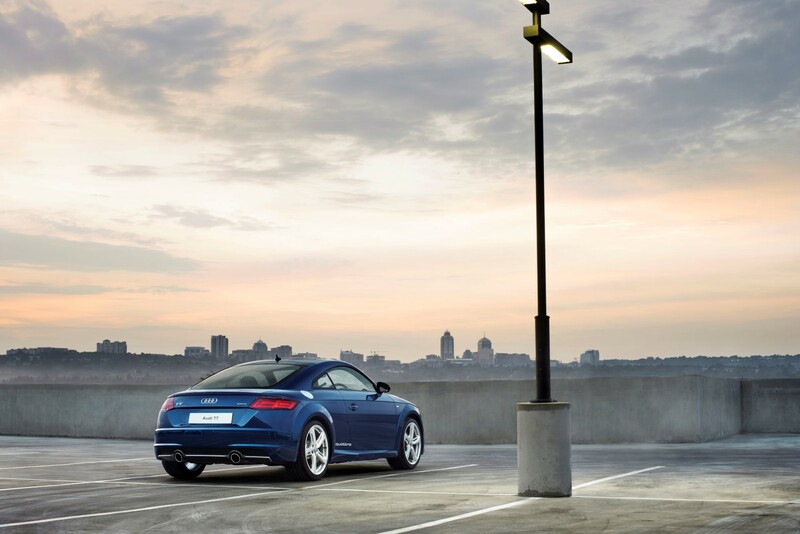 In the new Audi TT, quattro permanent all-wheel drive delivers additional stability, traction and driving fun. 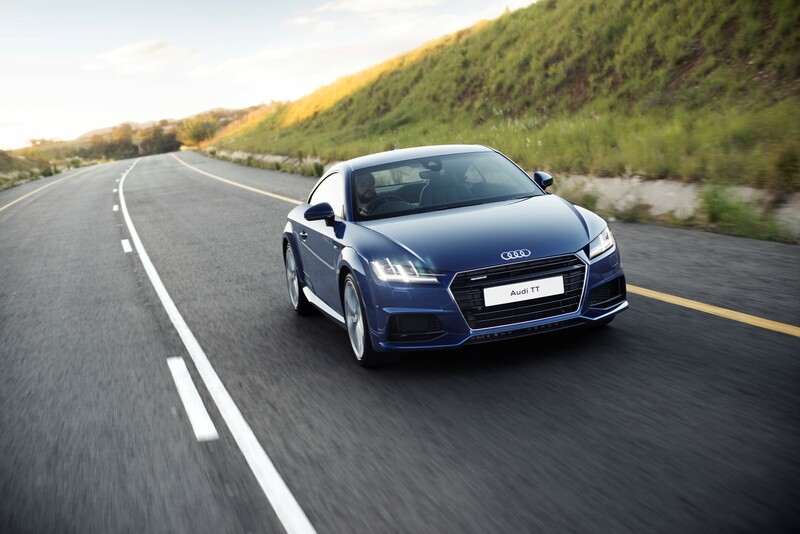 It has been consistently advanced and optimized especially for the new TT. Its electro-hydraulically controlled multi-plate clutch is mounted on the rear axle. The special pump design reduces weight by around 1.5 kg compared with the previous model. The distribution of drive torque between the axles is controlled electronically within fractions of a second. 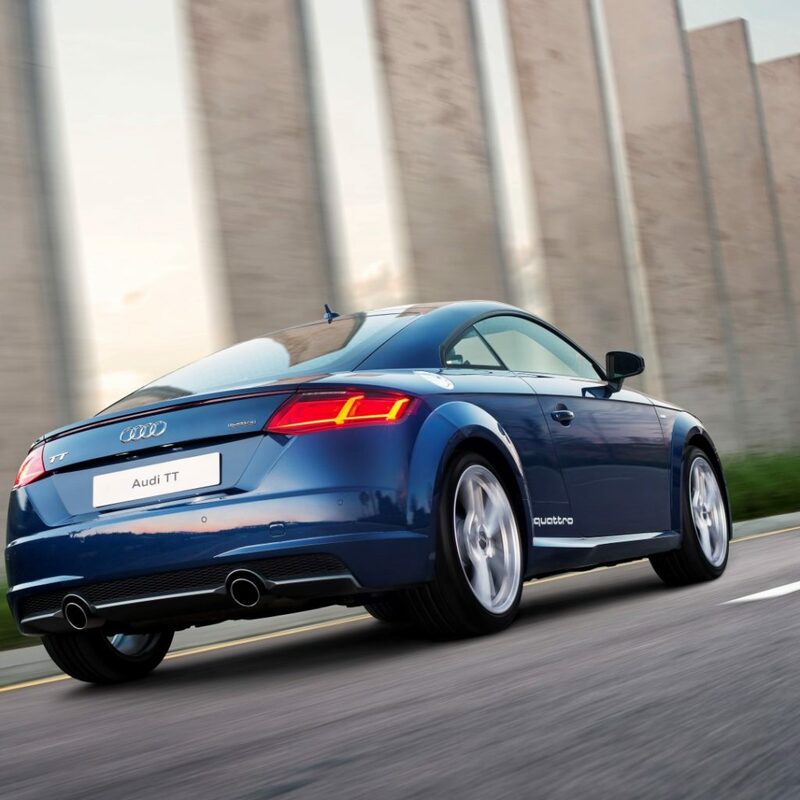 The intelligence of quattro drive – the software that determines precisely the possible torque distribution between the front and rear axles – is a completely new development especially for the TT. 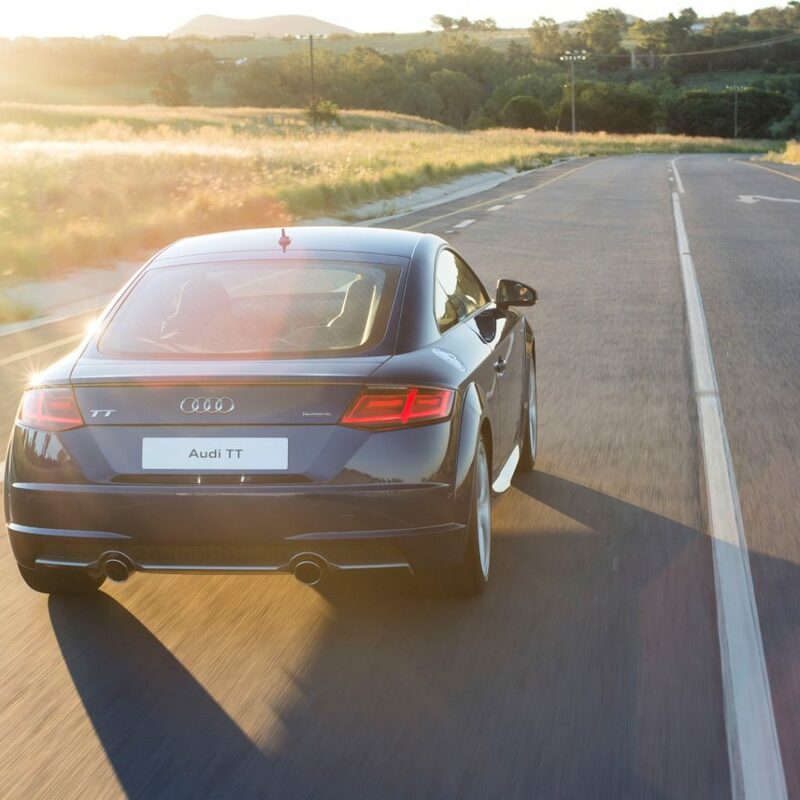 The innovative control philosophy continuously senses the ambient conditions, driving status and the driver’s wishes. 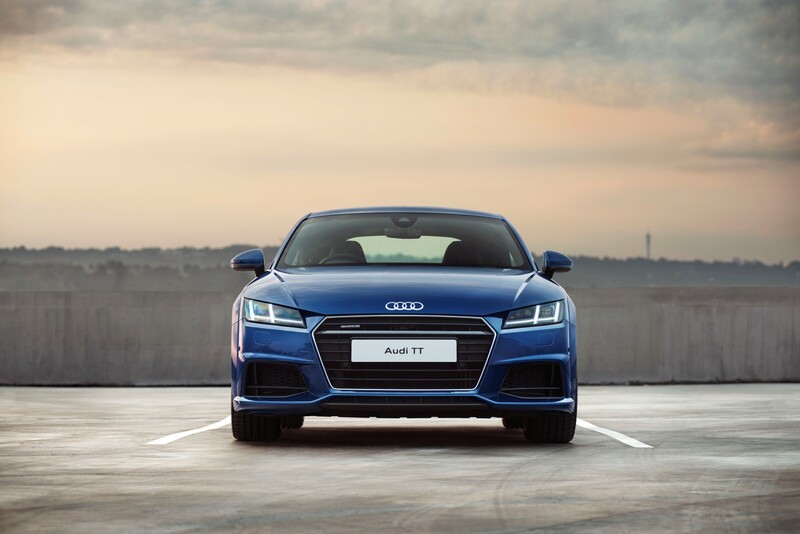 This means that the ideal distribution of torque is calculated and the TT’s dynamic drive characteristics enhanced in every situation. The front suspension is based on a McPherson system; aluminum components reduce the weight of the unsprung chassis masses. The four-link rear suspension can process the longitudinal and transverse forces separately. next post: We’ll Be Back!